Ideal location; just 50 meters from the beach with sea view. “Krystal Cottage” is a two-bedroom cottage which is ideally situated with views of the beach, just 50 metres away. It is an excellent base to explore the diversity of South African wine farms, wildlife and stunning Cape Town area and surroundings. The cottage is well equipped, accommodating 5 people and has an enclosed undercover BBQ area. The accommodation is situated in the Fleur Park Holiday Resort, which has a relaxed holiday feel to it and is next to the Krystal Beach Hotel. It is a short walk from the Marina, main beach and restaurants. The cottage is on ground level. There is a veranda area, with sea views, a table seating 6 and a fireplace. This is a lovely secure setting. There is an open plan kitchen living area, with one bed in this area. There is one room with a double bed and one room with two single beds. The bathroom has a shower with an enclosed part, which functions as a bath for children. There are two car ports. The cottage is opposite a rocky beach, which is ideal for catching fish and exploring the rock pools. The sandy main beach of Gordon's Bay is a short stroll down the coast and is ideal for body boarding. To the other side, you can relax at Harbour Island, where you can enjoy the marina atmosphere, enjoy lovely fresh seafood or even go on a boat trip; all less than 300 metres from the cottage. Outside veranda (BBQ area) seats 6. Inside dining room table seats 4. Inside kitchen counter/breakfast bar seats 4. This property is situated in the Fleur Park Holiday Resort, so guests have access to the communal gardens. Sea kayaking is offered at the main beach less than a kilometre away during the holiday season. This property is less than 300 metres from the Marina, where boat trips could be organised. “Krystal Cottage” is located along the beautiful Gordon’s Bay coast. It is ideally situated with views of the beach, just 50 metres away. It is an excellent base to explore the diversity of South African wine farms, wildlife and stunning Cape Town area and surroundings. The accommodation is situated in the Fleur Park Holiday Resort, which has a relaxed holiday feel to it and is next to the Krystal Beach Hotel. It is a short walk from the Marina, main beach and restaurants. The cottage is opposite a rocky beach, which is ideal for catching fish and exploring the rock pools. 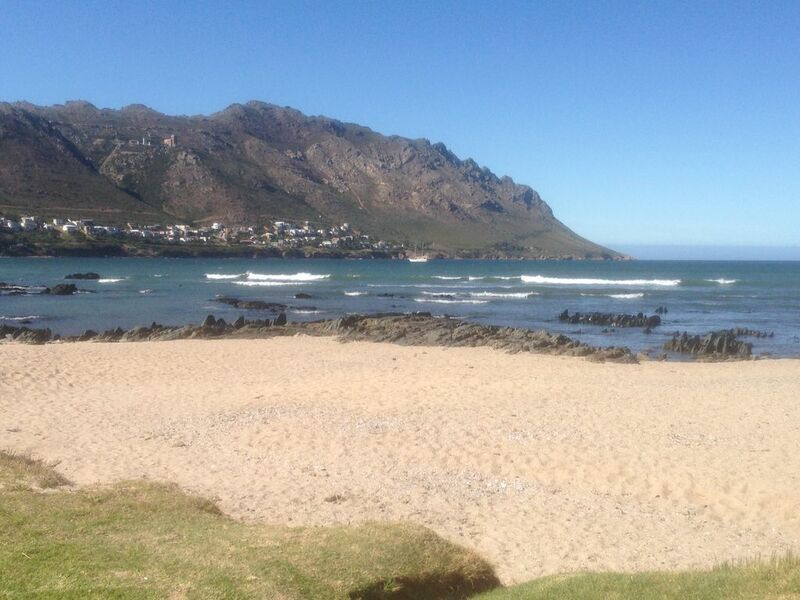 You can also take a short stroll down the coast to a sandy beach, ideal for body boarding (Gordon's Bay main beach). If you walk to the other side, you can relax at Harbour Island, where you can enjoy the marina atmosphere, or even go on a boat trip. You can enjoy seafood at Ocean Basket with stunning sea views, or have tavern food with harbour views at Bertie’s Landing. For a special treat, go to the Krystal Beach hotel for a meal. All these restaurants are situated less than 300 meters from the cottage. Other restaurants, like the family-friendly Spur, can be reached when walking to the main beach at Gordon’s Bay or by car (1.5 km). Gordon’s bay is a short drive (10km) away from Somerset Mall, which has many shops, restaurants and cinemas. Children, especially, will enjoy “super tubing” in the Strand (http://waterslides.co.za), the beach life or the Cheetah Outreach facility in Somerset West (http://www.cheetah.co.za). You can also take the scenic Clarence Drive (about 40km) to the Penguin Colony at Stony Point in Betty’s Bay or the Harold Porter Botanical Gardens. Close-by there are many world-renowned wine estates like Vergelegen (15km) or Spier (30km) or you may decide to visit historic Stellenbosch, only 30km away. You can also go on deep sea fishing trips from the Marina (enquire at the Gordons Bay Boat Angling Club) or try your hand at sea Kayaking, which is available from the main beach during the holiday season. The cottage is ideal to serve as a base for other popular activities, like Shark cage diving or whale watching, which can be done at Hermanus and Gans Bay.